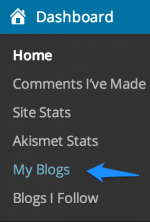 How can I change the url to my blog? Hello, I’m trying to change the website of my blog from mbewanevdp.wordpress to mbewane.wordpress…how can I do this? The blog I need help with is mbewanevdp.wordpress.com. That’s great news. Blog on! The topic ‘How can I change the url to my blog?’ is closed to new replies.